There are many ways to make chicken noodle soup, but I tend to prefer this method. Maybe because I like my soup vegetables the same texture as the noodles, but more honestly it’s probably because I’m lazy and this is a less fussy process. The vegetables and chicken make the broth and soup at the same time, keeping the cooking effort to a minimum. Which is nice. What you’ll need here is time to let everything simmer. About 2 1/2 hours of it. So this is something I like to make when I’m futzing around the house working on other projects. This is probably one of our family's favorite recipes. Print Recipe. 1. 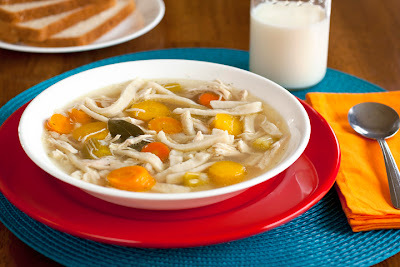 Stir the carrots, celery, onion, chicken bouillon granules, oregano, parsley, salt, pepper, bay leaves and chicken broth together in a large pot or Dutch oven; top with chicken skin side up. Pour the water over chicken. 2. Bring to a boil; reduce heat to low, cover and simmer for 2 hours. Scoop out chicken and set aside. 3. Return soup to a simmer. Add noodles, cover and cook for 30 minutes. 4. Meanwhile, discard skin and pull meat off of the bones. Shred into bite sized pieces. When noodles are done, return chicken to soup; discard skin and bones. Season with more salt and pepper to taste. This looks so delicious right now! Question...where might one find frozen egg noodles? I've never seen them at my grocer, but yours look so thick and yummy! Check your local store's freezer section, most places are carrying them now. Oh, I love chicken noodle soup! Especially as the weather is getting chilly. And this is such a simple method! This is how I'd go as well...the only time I like mushier veggies is in soup! Oh, how i love soup! SO perfect for this time of year - thanks for sharing!